It's films like this one that make me as optimistic as the townspeople of Pleasantville. That is because it makes me able to cherish the fact that there are people out there who CAN create something original and Pleasantville is something that I had never seen before. 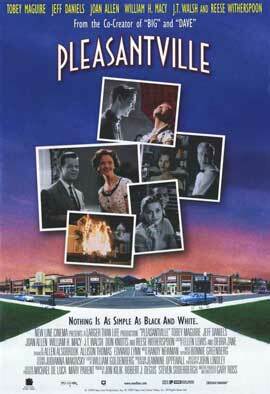 Pleasantville follows the story of two siblings named David and Jennifer (Tobey Maguire and Reese Witherspoon) who, while fighting over their remote, suddenly get transported into David's favorite TV series called Pleasantville. Since the series is black and white, both David and Jennifer are black and white like everything else in the town. But as they continue their stay, however, they literally bring "color" to this colorless town. First and foremost, the thing I loved the most was the cinematography. I liked the scenes where, as the town becomes colorful, they show people turning colorful while some people remain black and white. I also thought the whole idea of color literally being brought into this colorless town was very interesting. To me, the townspeople having their black and white colors stripped from their bodies is an amazing metaphor for their masks being taken off and them being able to discover what their wants and such are. I give major kudos to director/producer/writer Gary Ross for creating such an amazing idea and I thought it was perfect that he used a 50's town as the setting with cheeseburger joints, curly-haired housewives, the paperboy throwing newspapers from house to house and such. I feel that society back in the 50's and those types of towns were looked at as idealistic and seemingly flawless. So, to use that type of setting for a film where the wants and even insecurities of the different characters are revealed seemed very fitting. Not to spoil the film, but there is even a point where the uncolorful people decide to segregate those that aren't in black and white, also known as the "colored" people. So the film even demonstrates racism without using race. It's a very multi-layered story. Also, while I thought all the actors were very neat, there are a few standouts I'd like to acknowledge. One is Joan Allen, who plays David and Jen's TV mother Betty. Allen excels at playing a June Cleaver-type housewife who develops new experiences and becomes less confined once her colors start to show. What makes her performance work so well is the force of her restraint. Allen is one of our most refined actresses and her subtleties amazingly help carry this colorful multi-layered performance. Another standout in my opinion was Reese Witherspoon as Jennifer. Witherspoon's bubbly charisma that she brings not only helps her character that greatly influences the idyllic town of Pleasantville but is a great reminder as to why she became a star in the first place. I really enjoyed her when she was on screen. Overall, Pleasantville is a fascinating fable that successfully remains grounded in reality. It has phenomenal storytelling, beautiful, and I mean, BEAUTIFUL, direction and cinematography, as well as brilliant performances from its splendid cast. This one I would highly recommend to everybody as it is a feast for the eyes of the imagination with realistic storytelling. Honestly, watching this film makes me wish I lived in 50's so I could go to a cheeseburger joint for a milkshake. I am SO glad I discovered it!